As part of Narrabri Shire Council’s (NSC) commitment to providing a flood resilient community, NSC is preparing the Narrabri Floodplain Risk Management Study and Plan (NFRMSP). The NFRMSP will be a comprehensive floodplain risk management plan that will help guide NSC to address flood risk in and around Narrabri. NSC has commissioned WRM Water & Environment and Gleeson Surveying to help deliver components of the NFRMSP. Gleeson Surveying are a local company that have been tasked with delivering a property floor level survey for all land within the township of Narrabri. The property floor level survey will help NSC and Narrabri residents fully understand their flood risk and help inform Council’s future flood mitigation strategies. On behalf of NSC, from December 2018 until February 2019 Gleeson Surveying will be attending homes and businesses in and around Narrabri and taking a ground and floor level measurement at each property. Gleeson Surveying will be entering properties via the driveway or front gate during normal business hours for a period of 5 to 10 minutes. The surveyor will not require entry to your house/business and this process should not disrupt your daily routine. We thank you in advance for your understanding and ask that you let Gleeson Surveying staff conduct this important work without disturbance. 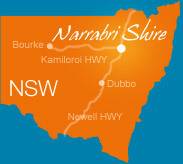 Should you have any questions please contact Narrabri Shire Council on (02) 6799 6866. Under the Swimming Pools Act 1992 Councils are required to develop an affordable and effective pool barrier program in consultation with the community. The Draft Swimming Pool Barrier Inspection Program is relevant to all swimming pools regulated under the Act with a significant portion of the Draft Program based around the inspection of premises with pools to ensure the pool barrier complies with relevant standard. Council, invites submissions from any interested party. Any submission should be addressed to the General Manager of Narrabri Shire Council, PO Box 261, Narrabri New South Wales 2390 and must be made prior to 5pm, 6 May 2019. Should you require further information in relation to this notice please contact Council’s Planning and Regulatory Department on 02 6799 6866. Council would like to advise there will be temporary road closures in Narrabri, Wee Waa and Boggabri on Thursday 25 April 2019, for the purpose of conducting Anzac Day Dawn Services, Marches and Memorial Services. Please find detailed road closure information below. The Minister for Water, Property and Housing is seeking nominations for board appointments to the Wee Waa Showground Land Manager. Further details can be found in the below document. Local Land Services has confirmed Parthenium weed has been located in Mungindi, Carinda and Lightning Ridge over the past couple of weeks and we now need your help to stop it spreading. Landowners are advised to never touch the plant with bare hands and always use a dust mask if working near the weed for extended periods. Please be aware that allergic reactions are not always experienced with the first contact with the plant but can develop after a number of exposures. Once a reaction to parthenium weed develops, some individuals may show similar reactions to related plants such as sunflowers. This reaction can be so severe that allergic people can be forced to move away from parthenium weed-infested areas. The weed is spread by seed and tolerates a variety of conditions. •	vehicles from infested areas of Queensland. Parthenium weed is an annual plant with a deep taproot and an erect main stem. The weed usually grows to a height of 1–1.5m although it can grow to 2m high. Please report all sightings of this weed to Council’s Weeds Officers on (02) 6799 6866.